Cancellations will only be accepted by phone up to one month prior to arrival date. For cancellations after this period Bluehostel reserves the right to charge you for the total amount due. In case of no-show or without a phone cancellation, Bluehostel reserves the right to charge you for the full amount of your reservation. Cancellations for Group reservation over Christmas, New Year’s Eve and Easter holidays will be only accepted two months prior to your arrival date. Bluehostel reserves the right to charge you for the full amount in case of cancellations after this period. 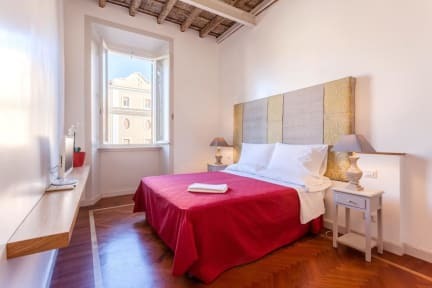 Bluehostel provides fantastic double and triple rooms and a fabulous designer apartment for up to four people in a great location, at walking distance to the Colosseum and every important site. Rooms can be set up with twin beds, double beds and we can add an extra bed in most of the rooms. Bluehostel is an ideal solution for couples, families or friends looking for beautiful, safe, clean and quiet designer rooms. Every room at Bluehostel has en-suite bathroom and shower, air conditioning, Lcd TV, free wifi and wooden floors. The rooms are daily cleaned and tastefully refurbished and are decorated with excellently preserved traditional ceilings. The area is great, close to everything that Rome can offer within nice walking distance. The best for those who like to escape from mass tourism and enjoy the real atmosphere of the city! Priceless tips by the owner on where to eat, what to do and how to jump the queue! In order to validate your booking please email the property with your estimated arrival time in Rome and a mobile phone number.